Brockhill is located on the old coaching route marked by several milestones in the area. The local beer house was the Jolly Gardener and is now the Stirrups Country House Hotel. Brockhill is one of the traditional small Victorian Villages set to the North of the Parish. Brockhill has no Steering Group representative at present. The village of Chavey Down was originally Common Land within Windsor Forest. In 1813 all the common land was enclosed and vested in George III. Vast areas were divided up and bought by various land owners. Chavey Down was vested in Samuel Sewell which he divided into plots and sold for development. There are three distinct areas of Chavey Down – the village, Birch Lane and Chavey Down Road. the first house in the village is believed to be Rosemount in Priory Road which was built in 1879, after which the Victorian village began to grow. This was before the invention of the motor car. 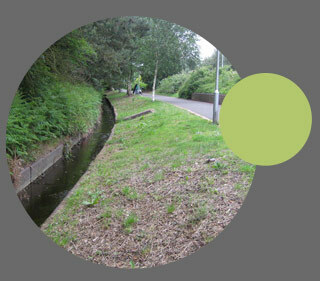 The area was part of the Warfield Park Estate and is part of Big Wood. The area in Birch Lane became developed just after the second world war with families over spilling from London and installing caravans along the old dirt track. These were gradually replaced with housing. 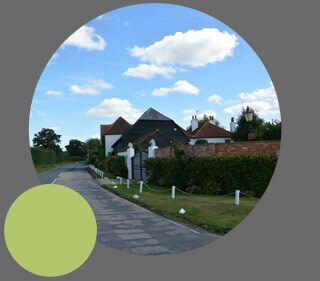 The rear of the area is classified as Countryside whilst the relatively smaller plots to the front are settlement. The area near Chavey Down Farm is the second highest point in Berkshire and in the 1700’s was the location of a Windmill. Mushroom Castle was occupied in the early 1800’s by erection of shacks with turf or branches for roofs. This was the site of the first house in the character area. Primarily late Victorian in nature, the area became more populated as the brick industry flourished both at Swinley Road and in Chavey Down Road itself. There was also work at various farms to be followed by work in the 1920’s at the carnation flower nurseries which is now the Carnation Estate also known as the Old Inchmery. Cheapside is a small village which is split between the Parishes of Sunninghill and Ascot and Winkfield. 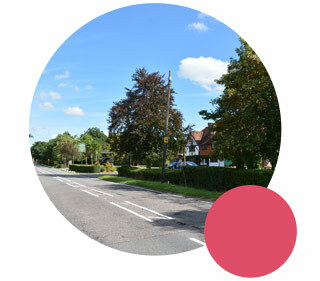 Although 2 roads lie within the Parish, this area is not intended for inclusion in the Winkfield Neighbourhood Plan as it has been covered in other Neighbourhood plans. Cranbourne village became a separate village in 1851 and as with most of the northern villages dates back to the late Victorian era although several properties date back to the 16th and 17th centuries but some have 18th and 19th century additions. Chilston Grange, a former hunting lodge is linked with Henry VIII and Anne Boleyn apparently confirmed by a glass coat of arms. Herne’s Oak dates from 1640 with believed connections to Nell Gwyn. To the South lies Ascot Place (Grade II Listed), a registered Park and Garden dating back to the mid 18th Century with the finest man-made ornamental cavernous grotto in the country. To the North lies Kilbees Farm which is also listed. Cranbourne Primary School was founded by the Earl of Ranelagh in 1709. Originally located at Cranbourne Hall and called the Green School it moved to Lovel Road in 1878. Forest Park is a purpose built 1980’s residential area midway between Ascot and Bracknell built as Bracknell New Town continued to expand. 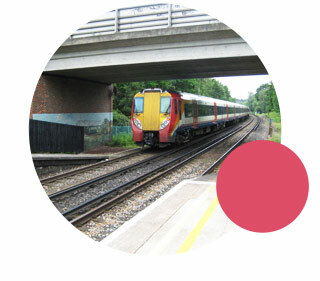 The New Forest Ride was deliberately built to the side of the development and edging onto Forest Land to protect the amenity of residents. The area contains about 1800 houses which were built on land that was originally part of Swinley Forest and Crown Property. It consists of a range of accommodation to meet all needs with local shops and a Community Centre. 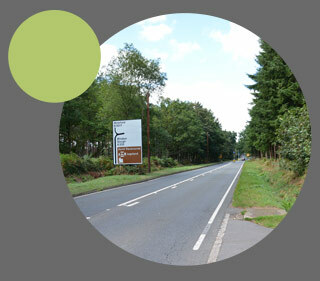 Forest Park is sandwiched between New Forest Ride, A322, Blue Cycle way and Savernake Lake. Between the bridge (the road has been straightened now but this was always known as The Skew Bridge as it went from one side of the road to the other) and the junction with Swinley Road was a Railway station known as Ascot West. This served the Swinley Brickworks to take bricks where there was demand. This operated from 1878 and was horse powered. The Brickworks had a small railtrack on site to take bricks to this station with a special road crossing. It was also used by the Bertram Mill Circus who transported animals in cages to winter quarters, the elephants walking to their winter quarters at Englemere farm in the early 1930’s. During the last war the station was used by troops but in WW1 it was used by the Royal Flying Corps Camp. During the last war a PoW camp was adjacent. 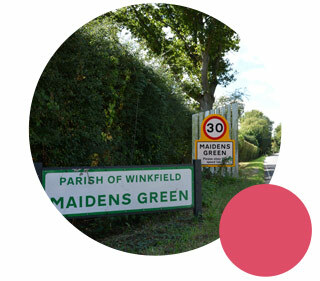 Maidens Green forms the most northern part of the Parish of Winkfield and is part of the earliest known history of the Parish with a high proportion of heritage assets. Boundaries date back to 942 AD when King Edmund, later Henry III, granted 151 acres of the forest of Winkfield in lieu of rents from Windsor, Cookham and Bray. In 1524 Henry VIII granted the Manor of Chawridge. Part of the manor today has the remains of moats in Winkfield Lane which can still be seen. Farming was the main occupation of the area and it is still farmed today and remnants of the open field system can be observed. Parker’s Lane Mobile Home site formerly, Sunnybend Farm, was established just after WWII. Maidens Green has an open rural character with much tree cover and hedgerows. Maidens Green lacks a central focus (village green) and currently suffers with poor broadband and mobile phone signals. Martin’s Heron and The Warren is a purpose built residential area midway between Ascot and Bracknell. It contains about 800 houses which were built on land that originally constituted the grounds of the Martins Herne (Heron) mansion. The mansion was demolished in the early 1980’s. Picket Post Close was used for the Harry Potter films. With late Victorian roots this area has developed into a C20th suburb without clear design guide. However design has improved markedly since the Unitary Authorities came into force. The historic Jubilee Recreation Ground is well used and a useful asset. This character area contains the medieval Winkfield Manor built in 1726 for George III as a hunting lodge. It was listed but has been allowed to deteriorate to such an extent that it was sadly delisted. 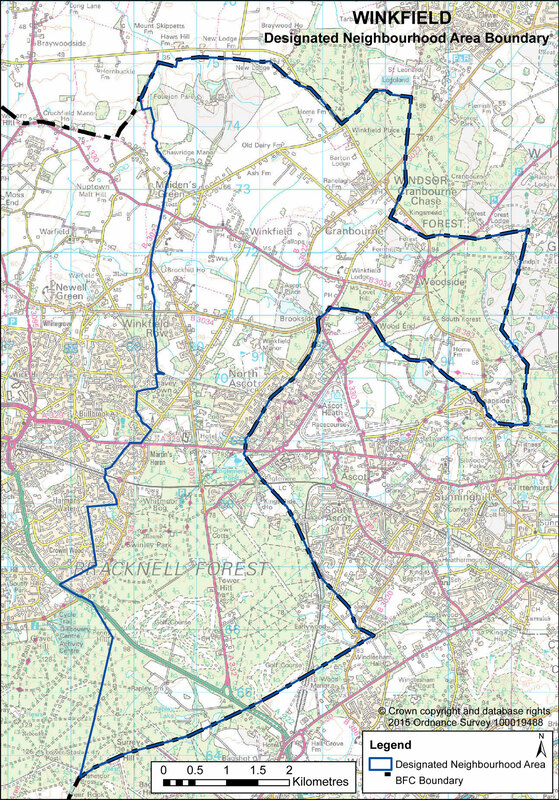 New Road is split between 2 Boroughs with the West side being Bracknell Forest and the East Windsor and Maidenhead. 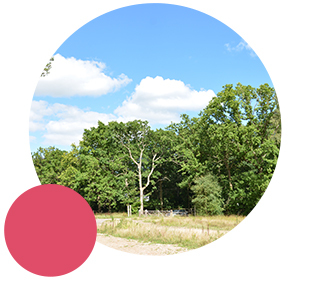 Winkfield was created from the clearance of the woodland during the Saxon period c600 -700 AD. The name of Winkfield derived from Wineca’s Field and was noted in the survey of the parish boundaries dating from 942AD. The Church of St Mary is the focal point of the village and dates from at least 1297 standing on the highest point in the village. The Church was built on land originally belonging to the Abbey of Abingdon and retains elements of the original c13th build, and is a Grade II* listed building. Winkfield Row North is a ribbon development, the village taking its name from the road running north to south linking Forest Road (B3171) to Brock Hill. Most of the buildings are from the Victorian era although parts of some date back to the 16th century. Lambrook School has been used for education since 1860. Although until the latter part of the last century a village with its own Post Office, shop and two pubs, Winkfield Row now sports only a restaurant and a Working Men’s Club.